Last year, nearly three million employees suffered a work-related illness or injury, according to the U.S. Department of Labor. In Delaware, state officials estimate over 2,800 workers are injured on the job each year. For these workers and their families, these injuries and illnesses can be devastating. An injury can cause an employee to miss work and lose valuable income, in addition to experiencing physical and emotional pain. If you were recently injured in an on-the-job accident, here's what you need to know about workers' compensation claims in Delaware. You can contact the experienced Wilmington, DE Workers' Compensation Attorneys at Morris James Personal Injury Group by filling out a contact form. To support workers’ during their recovery, most employers are required to offer workers’ compensation benefits. This compensation can be obtained to supplement lost wages, helping an injured employee receive necessary medical treatment and maintain his livelihood. While these benefits are required by law for most employers, there are exceptions. It is often incumbent upon the employee to prove the workplace injury or illness, and it is important that an injured worker takes certain steps to maintain his eligibility for compensation. Seek immediate medical treatment. Employees should seek medical treatment for any injury, even a minor one. In rare cases, seemingly minor injuries can develop into more serious health problems. Official medical documentation can strengthen a claim, and prompt care can promote a quicker recovery. Also, employees should retain any medical bills related to the injury or illness. Talk to the employer about the illness or injury. Report the injury to the employer in writing as soon as possible. If an employee fails to report an injury or illness, they could be denied workers’ compensation benefits. Retain an attorney. Though a lawyer is not required for workers’ compensation cases, an experienced attorney can help an injured worker navigate the complex benefits system and obtain the maximum benefits. A workers’ compensation case is not legally considered a lawsuit; the benefits are viewed similar to health insurance benefits. However, the outcome of the case is legally binding, and there are certain circumstances in which the employee is permitted to sue the employer outside the workers’ compensation system. File a claim with the workers’ compensation board. Employers should provide employees with the information necessary to proceed with the claim. 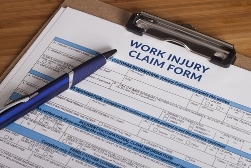 If the employer is difficult to work with or is attempting to deny the claim, the injured worker will have to pursue the claim with the state’s Office of Workers’ Compensation. What Does a Work-Related Injury in Dover, Delaware Look Like? Workers’ compensation benefits cover workplace accidents and injuries, as well as illnesses related to the job. In addition to common accidents like falls or collisions, the benefits can also cover stress or repetition injuries. Additionally, injuries off the work site that occur in the course of completing a job task, such as on travel for business or work-related errands may also be eligible for workers’ compensation claims. If you or someone you love has suffered an injury or illness at work, you may be entitled to make a claim. Contact our experienced Dover, Delaware workers' compensation attorneys at Morris James Personal Injury Group to learn more about your case and schedule a free, no-obligation consultation.